An absolutely iconic card which ranks among the premier modern sports cards in the hobby and is exceedingly desirable in perfect condition. The offered '10' is incredible from every angle and boasts fantastic centering, four extremely sharp corners and undeniable GEM MINT card stock. The surfaces are magnificent and are free of any print dots and displays outstanding color. 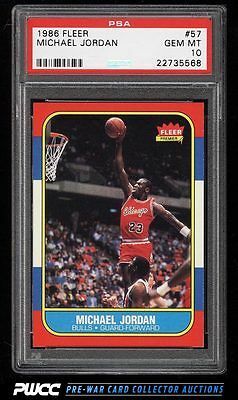 Jordan rookies continue to rise in value and represent one of the most sound investment cards in the hobby. As fine as they come and deserving of attention. One of nearly 17,000 cards, lots, and sets up for bid in our 8th Auction of 2016. Click on the link above to view the other PWCC auction lots.